We summon you to take the time to relax, reflect, and rejuvenate in one of the world’s most beautiful and tranquil environments. While the winter days are short and cold, you can bask in the sun and peace of beautiful Nosara, Costa Rica. 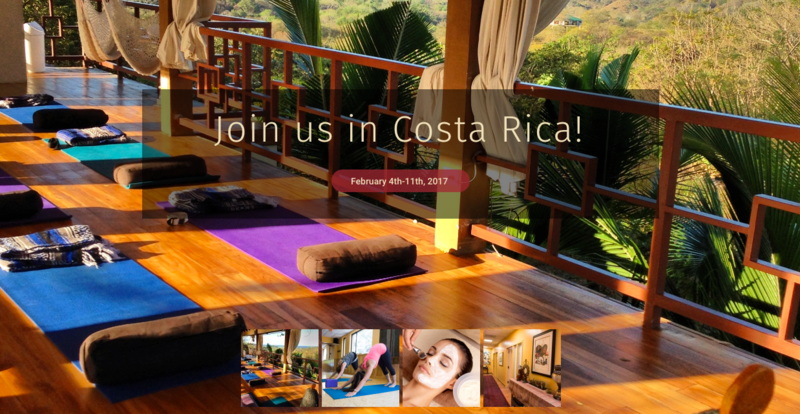 Imagine waking gently to the natural sounds of the jungle, and then nourishing your body, mind and soul through yoga practice, Intuitive readings, hypnosis, spa treatments and the divine regional cuisine. When you visit this region of Costa Rica, you will have the opportunity to discover and explore one of the world’s five “Blue Zones.” A Blue Zone is defined by Dan Buettner in his book The Blue Zones: Lessons for Living Longer from the People Who’ve Lived the Longest.Residents of these places produce a high rate of centenarians, suffer a fraction of the diseases that commonly kill people in other parts of the developed world, and enjoy more healthy years of life. Ridgely Retreat Yoga practitioners will be your guide on your journey to restore inner peace and tranquility. The Goddess Retreat is lead byAndie Lichtenstein, who has a passion for a yoga practice that leads her students through all levels of consciousness to achieve harmony from within toward discovering peace, joy, and creative expression. Also contributing is internationally known psychic, Dr. Gwen MacGregor. She will be leading Goddess workshops, meditation, and offering readings, hypnosis and past life regression. 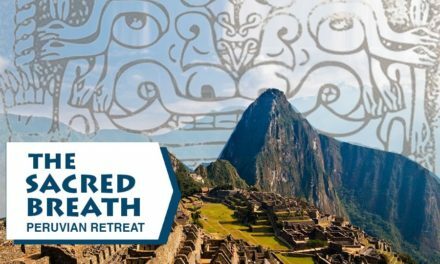 Join us at the Akhi Retreat, which is perched on a mountain overlooking the Pacific Ocean. Soak in the magnificent views and delight your senses during your daily yoga and meditation practices. There is also a variety of spa treatments, activities, and excursions you can participate in, exercising the body while renewing the mind. This combination will be sure to immerse your soul in pure joy and bliss. During your free time, you will be lead to discover, and find exactly what you need. Whether it is enjoying a relaxing time at the pool, walking along the beach, receiving the wisdom of a psychic reading or hypnosis session, pausing to watch the sunset, or venturing to Nosara to explore the unique shops. The region also offers a variety of excursions including zip-lining and kayaking. Andie will lead daily yoga practices, Dr MacGregor will lead daily Goddess workshops. All of this combined will serve to enlighten the mind and enrich the soul. If you are interested, we urge to please call us for more information. The deadline for booking the Goddess Retreat is October 1 , 2016. Join us on a journey to begin 2017 in a state of perfect awareness. 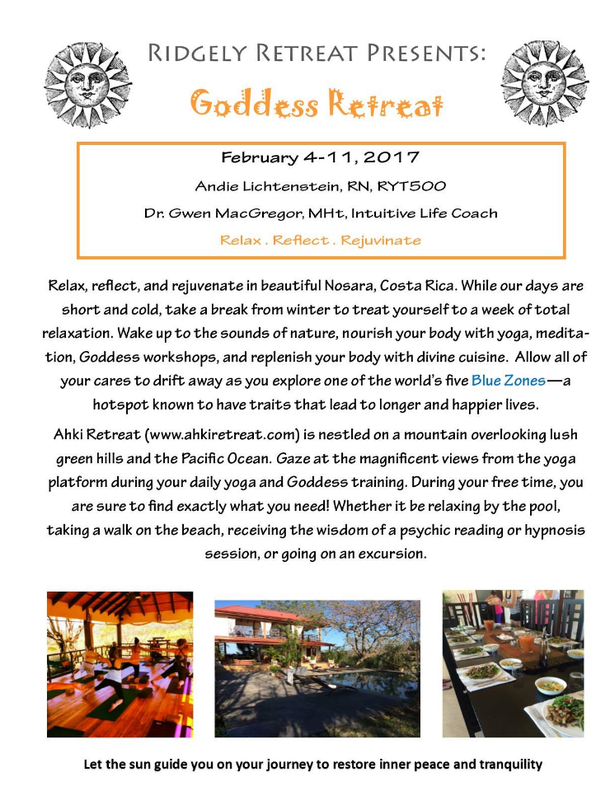 The Goddess Retreat takes place February 4-11 2017. Contact Ridgely Retreat for more information.